Of the three species of the genus Graphisurus occurring in Missouri, G. triangulifer is both the most attractive and the least commonly encountered. Back when I surveyed the Cerambycidae of Missouri (MacRae 1994), I examined only 45 specimens of this species in the major public and private collections of the state, compared to slightly more of the equally uncommon G. despectus and a whopping 271 of the übercommon G. fasciatus. Nearly all of the specimens I examined of this species were encountered at lights, and it has been in this manner almost exclusively that I have seen the species for myself. The species is named for the dark triangular markings on the elytra. The individual in these photos was seen at Sam A. Baker State Park in the southeastern Ozark Highlands of Missouri during early July, and—like most of the others I have seen—it was attracted to my blacklight. I really don’t like photographing insects directly on the white landing sheet that I use for blacklighting, so I moved the beetle to the trunk of a nearby boxelder tree (Acer negundo) for a more natural looking background. There are a few reports of the species utilizing Acer for larval development (Lingafelter 2007), so this could be a very natural setting; however, I have not seen any actual records of the species being reared from that host. More often the species has been recorded breeding in dead sugarberry (Celtis laevigata). While I have conducted many rearings from Celtis, I’ve not yet succeeded in rearing this species—I suspect it probably breeds in larger diameter branches given its relatively large size (12–17 mm in length). This idea is bolstered by the fact that the one adult that I did not encounter at lights was found on the trunk of a large, dead sugarberry near San Antonio, Texas. Hoffman et al. (2002) noted that the species exhibits a southern, lowland distribution extending from Long Island to central Georgia, thence west to Texas and northward in the interior as far north as Ohio and Indiana (it has also been recorded from Kansas and, of course, Missouri). This distribution pattern agrees largely with that of Celtis laevigata in the eastern U.S., suggesting that this plant may indeed be its primary host. A fairly restricted host range for G. triangulifer would not be unexpected, since each of the other two species in the genus also exhibits a fair degree of host fidelity—G. 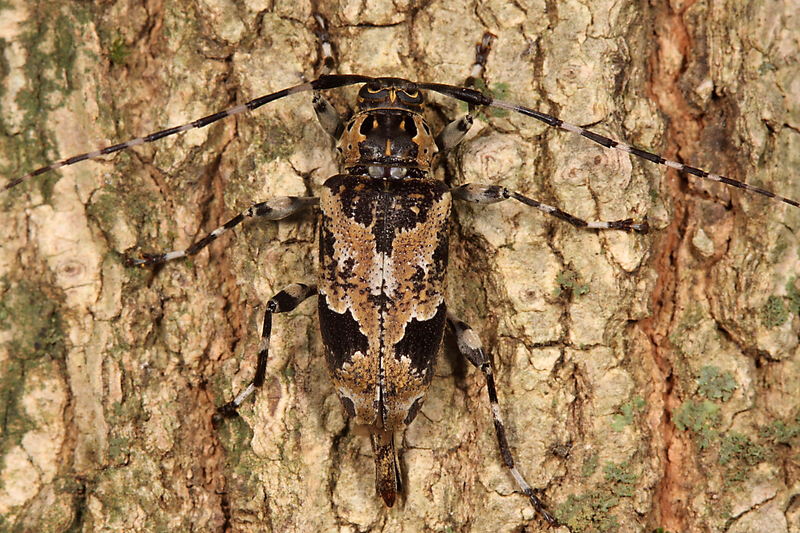 despectus breeds almost exclusively in hickory (Carya spp. ), while G. fasciatus breeds primarily in oak (Quercus spp.). It never ceases to amaze me what bastions of insect diversity the genera Celtis, Carya, Quercus are! Especially Quercus – a quick check of my database showed ~400 host records from Quercus among the Buprestidae and ~600 among the Cerambycidae. Acacia and Prosopis also host a fair chunk of diversity in the southwest, especially among Buprestidae. Very cool, Ted! I could definitely cultivate an interest in these. Thanks, Ben. Hey, you still have loot coming to you for winning BitB Challenge session #2. Hey Ted. Indeed I have not forgotten. I’m just harder to pin down during the field season. Hats off!!! to you and people like you who explore, study, preserve natures little but very important members. Late to the party here but so glad I found this amazing site…thanks Ted! Right you are, I have hand collected and reared G. trianguilfer from Celtics occidentalis here in Ohio and they seem to prefer larger branches and main trunk sections. 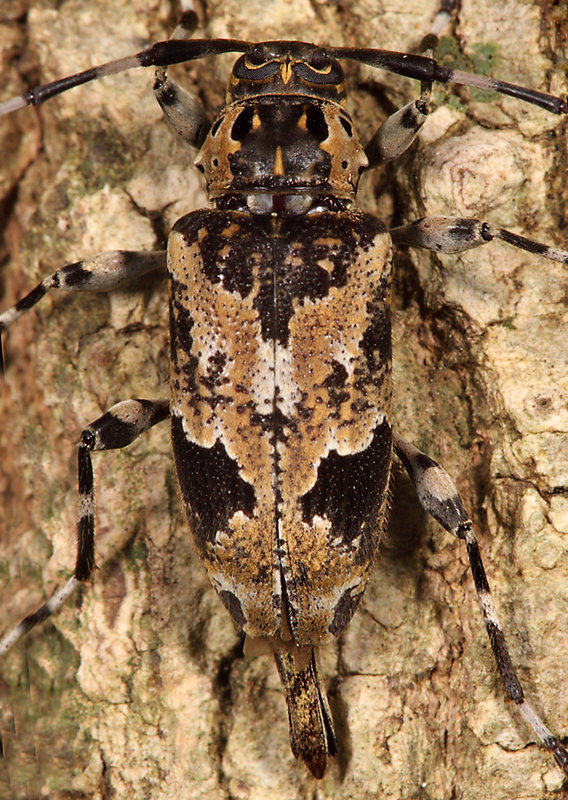 I first collected this species by spotting an individual that dropped to the ground from a recently cut and downed Hackberry tree about 10 inches in diameter while crawling over the log to beat the crown branches. Seeing this, I placed my sheet under the trunk and ran my hand along the underside and it began raining G. trianguilfer! I came back the following weekend with my chain saw and cut 6 logs about 4 feet long and placed them in my garage and the beetle emerged within days. I also brought back smaller branches and didn’t get a single beetle. Should read Celtis occidentalis L. and G. triangulifer…posted from my iphone, spell correct ugh, haven’t figured out how to edit my post…?